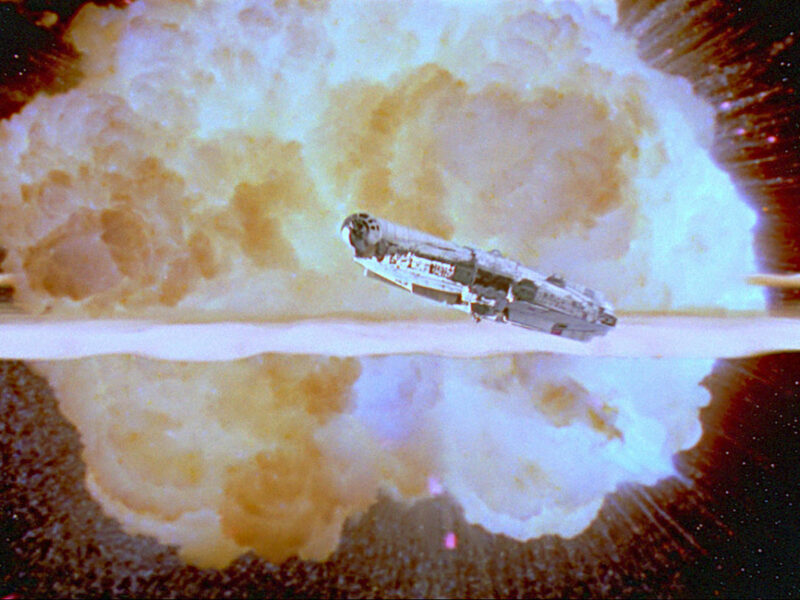 Being a Star Wars fan growing up in the UK during the ’80s was a unique experience. Sure, like our fellow fans across the globe we had the films, the action figures, the books, and the food promotions, but we also had access to a number of things that fans around the world didn’t. We got the chance to watch Admiral Ozzel wear a wonky wig on BBC kids show Grange Hill. We saw Gold 2 play a role in popular early evening soap Crossroads. We even saw Darth Vader showing kids how to cross the road safely dressed in tight green spandex. 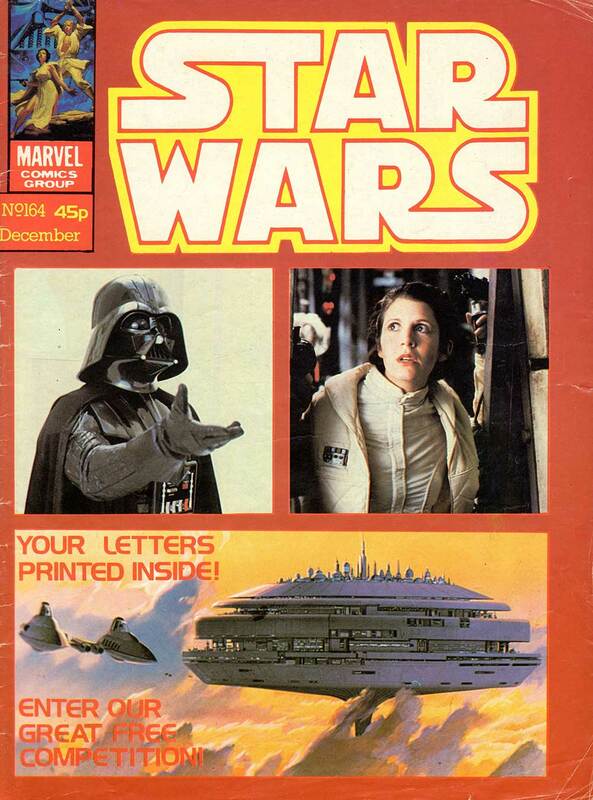 But the one thing that really set us apart from our American cousins were Marvel’s Star Wars UK titles. Starting on February 8, 1978, Star Wars Weekly ran for 117 issues and broke down, into weekly installments, the original adaptation of Star Wars by Roy Thomas and Howard Chaykin. It then on to the further adventures of our heroes as what was the 7th issue of the American title hit the UK reprints and gave British kids a glimpse into the exciting future of Star Wars, in what were essentially the first Expanded Universe stories (and later, Legends). But that wasn’t all. The UK titles gave us unique covers, classic Marvel back-up strips from the ’60s, ’70s, and ’80s, original posters with exclusive artwork, our own editor droid in C.Y.R.I.L, and littered the issues with images from the film in a time when such pieces were a rarity. Throw in an active letters page (in which yours truly had a letter printed back in issue 11 of Return of the Jedi weekly in 1983) and you had yourself a very busy magazine. In time we’ll come back to take a look at some of those earlier issues and delve into what made them special and unique, but to kick off I’ll move forward a few years to 1982 and Star Wars Monthly. 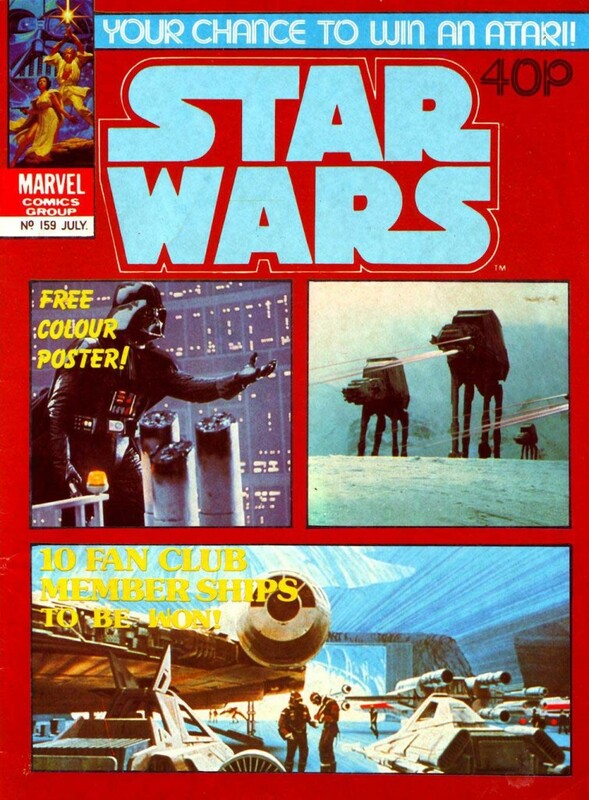 After 117 issues of Star Wars Weekly, the magazine (and I say magazine intentionally, having interviewed Marvel UK editor-in-chief Dez Skinn who went to great lengths to state that he considered the title a magazine, not a comic) changed its title to The Empire Strikes Back Weekly, then with issue 140 in November 1980, to The Empire Strikes Back Monthly. 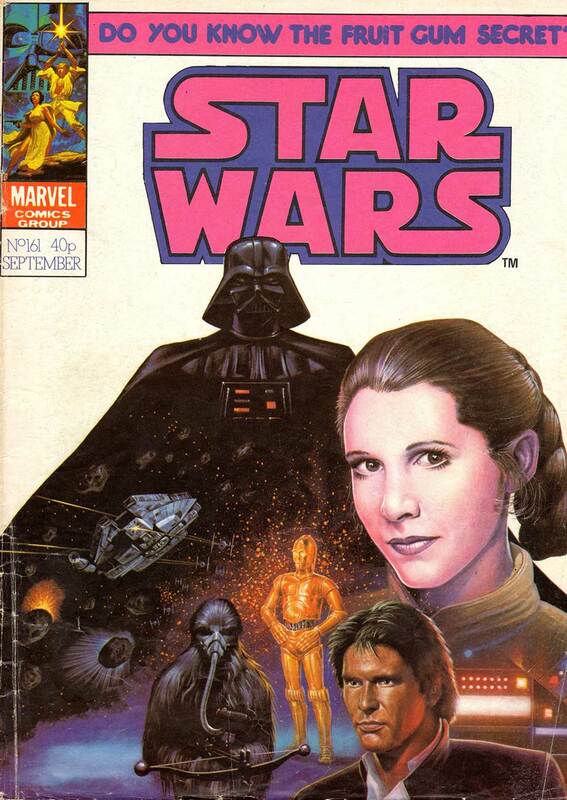 By July of 1982 and the 159th issue, the title reverted back to the catch-all moniker of Star Wars and remained a monthly title until July 1983 and issue 171 when Return of the Jedi Weekly issue 1 arrived for a run of 155 issues. 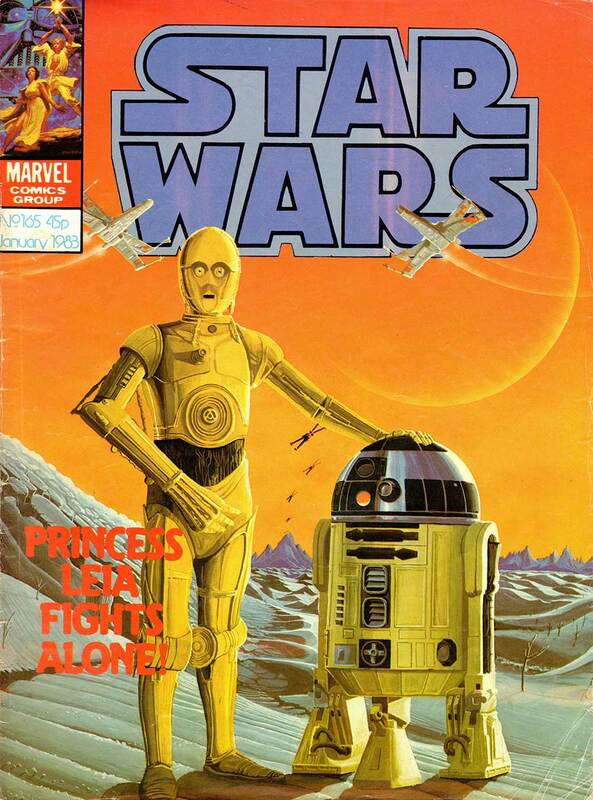 Star Wars Monthly was a pivotal title at a key time in the lifespan of the saga, especially here in the UK. 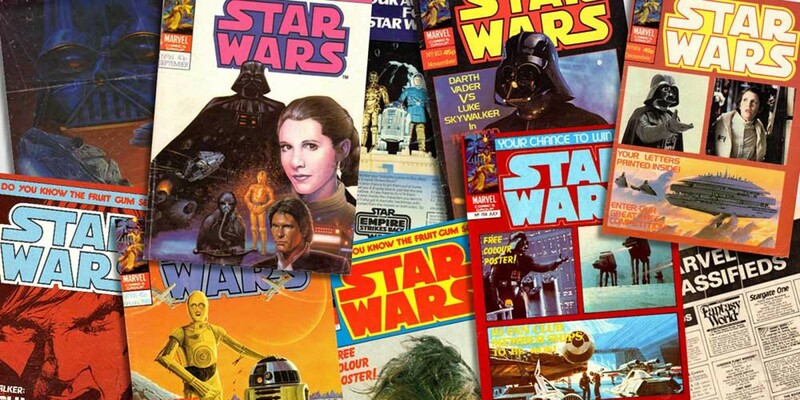 In a time where the only new Star Wars stories came in the form of either comic books or our own imaginations as we played with our Palitoy playsets and action figures, these stories would lead us into the final part of the second trilogy. Little did we know then that the wait for the first trilogy would be another 16 years. Issue 159 arrived in July of 1982 and reprinted the US #59 story “Bazarre,” a classic that featured Orion Ferret, an old friend of Lando Calrissian. 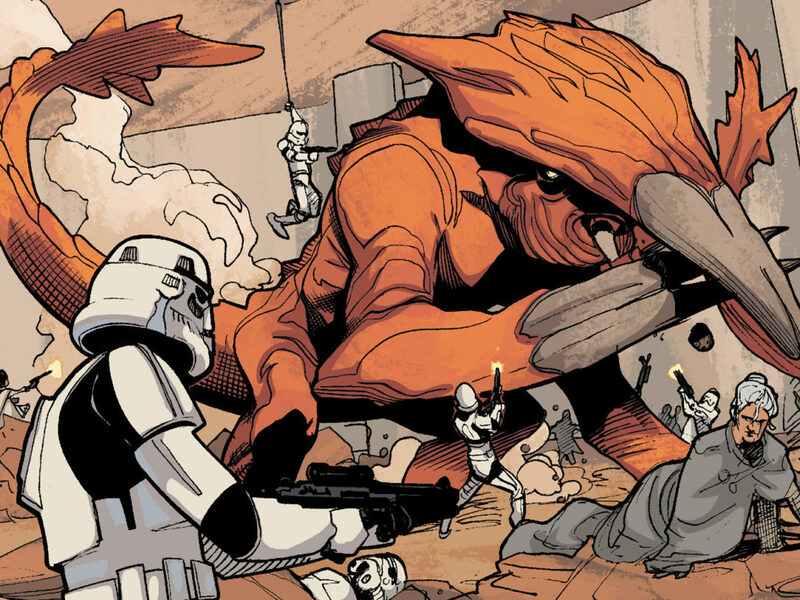 Great art, a lot of fun, and 100% classic Star Wars in the traditional Marvel manner. But Star Wars comics readers can read about “Bazarre” anywhere. What we’re investigating is what made the UK issue 159 any different to the US issue 59? Well, the UK title was wrapped around a unique collage cover featuring a selection of Ralph McQuarrie artwork from The Empire Strikes Back, and within its pages featured “The Watcher Must Die!”, a vintage “Tales of the Watcher” by Stan Lee and George Tuska from Tales Of Suspense #58 October ’64. Non Star Wars for sure, but the importance of those back up strips cannot be underestimated, as it opened a huge swathe of young readers to the wider Marvel comics universe and the treasures held within. As well as the chance to win an Atari and 10 memberships to the Official Star Wars Fan Club (OSWFC), UK fans were also treated to “Blind Fury,” a short story written by the soon-to-be legendary Alan Moore and drawn by John Stokes, who also drew other UK exclusive stories “Death Masque,” “Dark Lord’s Conscience,” “The Flight of the Falcon,” and “Tilotny Throws a Shape.” Reprinted many years later in Dark Horse’s Devilworlds series, these stories were exclusively written and drawn for the UK title and wouldn’t see American shores outside of those fans who subscribed to the UK monthly and had it shipped across the ocean. 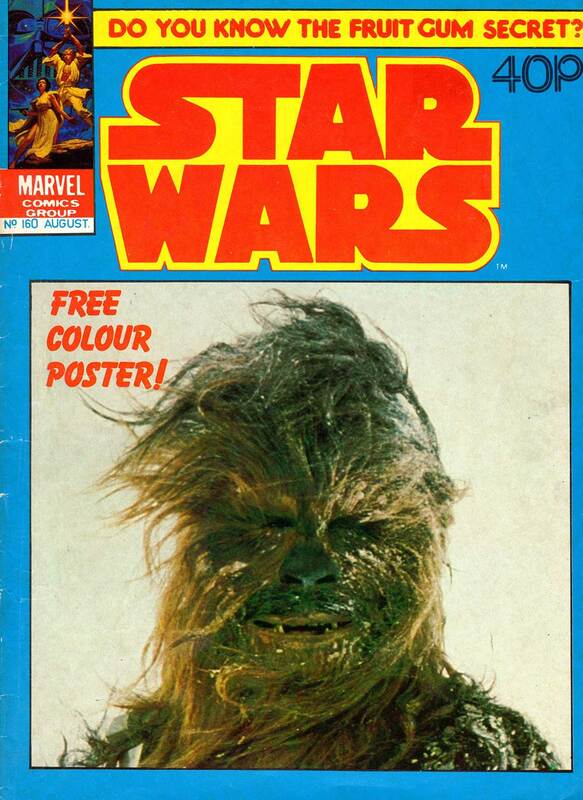 Issue 160 arrived in August 1982, bound in a Chewbacca photo cover showing the snow-swept Wookiee on Hoth. The issue also brought us “ROM Spaceknight,” written by Bill Mantlo and illustrated by artist Sal Buscema. ROM was licenced to Palitoy in the UK as part of the Space Adventurer Action Man line and appeared in 1980 catalogs, so inserting him as a backup strip was a logical move. 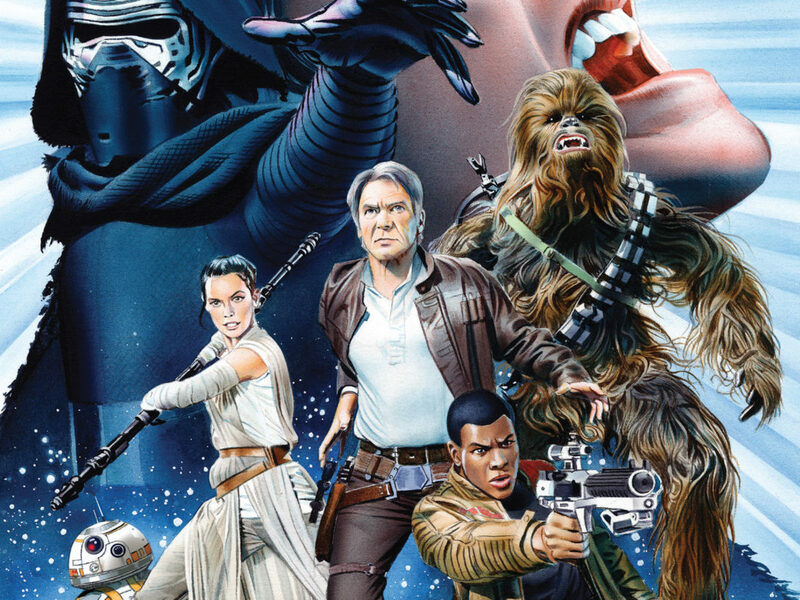 September’s #161 features a cover that would catch the eye of any Star Wars fan. Painted by the legendary Jolly John Higgins, this collage shows characters from The Empire Strikes Back with the most prominent being Leia and a menacing Darth Vader in the background. The issue reprinted the iconic “Screams in the Void,” written by David Michelline, and drawn by Walt Simonson and Tom Palmer. This brought us the “death” of Shira Brie at the hands of Luke Skywalker and also brought us the arrival of Power Man and Iron Fist into the ROM Spaceknight story. 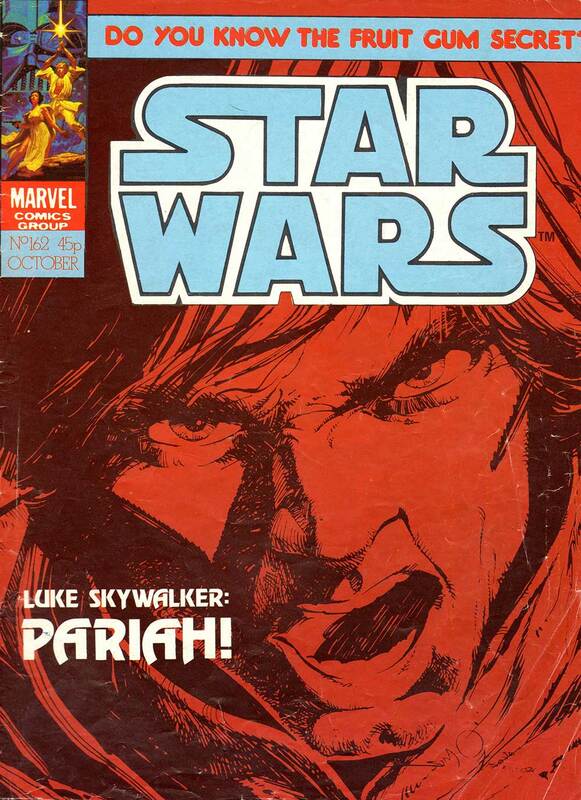 The cover of issue #162 features art by comics legend Walt Simonson; the same art wraps around US issue 62 (the only time this happened for Star Wars Monthly), and continues the Shira Brie arc with “Pariah,” as all eyes turn on Luke, blaming him for Brie’s death. And the issue ended with an appearance by Darth Vader (a HUGE deal at the time). This month’s competition allowed you the chance to win a copy of the 1981 Star Wars annual, featuring a Paul Gulacy cover and the stories “The Third Law,” “Death Probe,” and “Droid World” from The Empire Strikes Back Weekly 136-139, The Empire Strikes Back Monthly 140, and The Empire Strikes Back Monthly 142. Unlike their US cousins, UK annuals were and still are hardbacks printed in the larger UK magazine format. ROM returned, as did the classic Marvel back up strip with Stan Lee and Steve Ditko’s “I Saw A Martian” from Journey Into Mystery #93, June ’63. More schooling in the history of comics from the House of Ideas. 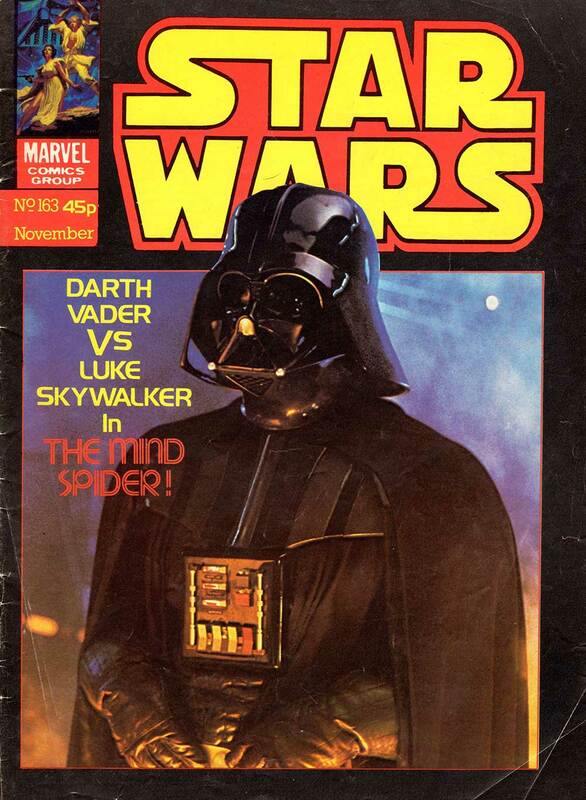 A photo cover of Darth Vader adorns the cover of issue 163, which brought us a reprint of US #63’s “The Mind Spider” by David Michelline and Walt Simonson and drawn by Tom Palmer. Luke infiltrates an organic Imperial compound — the Mind Spider — to gather info on Shira and learns she was a hand of the Emperor; along with Chewbacca they barely escape. The strip ends with the the barely alive body of Brie floating in a bacta tank. ROM fights alongside Nova in the main back up strip and our competition gives us the chance to win a Spider-Man annual. December, the Christmas issue and number 164, which had a cover collage featuring images of Vader and Leia from Empire and an iconic McQuarrie production painting of Cloud City. The issues reprinted US #64’s “Serphidian Eyes,” written by David Michelinie and Michael Fleisher with art by Joe Brozowski and Vince Colletta — a medieval story transplanted into the Star Wars galaxy. The issue also included ROM and Nova battling against the Skrull Empire and, from December ’62, “I know The Secret of the Sea Monster” by Stan Lee, his brother Larry Leiber, and art by Paul Reinman. A typical Marvel morality tale of woe and doom, it sat well alongside the space fantasy of Star Wars. Of note for older UK readers are the classified pages: Many of the shops mentioned are long gone. The Sheffield Space Centre is now online only, Fantasy and Comics Explosion in Birmingham is history, Edge of Forever in Welling is gone as is Stargate One in Rochester. Only Nostalgia and Comics in Birmingham (one of the oldest comic shops in the UK) and Forbidden Planet still remain. We’ll wrap up this retrospective with a look at issue 165, which reprinted the US issue #65, “Golrath Never Forgets.” Written by David Michelinie and Walt Simonson, pencilled and inked by Tom Palmer, folks will remember this was the issue where the walls of the Rebel base on Golrath were “remembering” and recording the events that happened there. 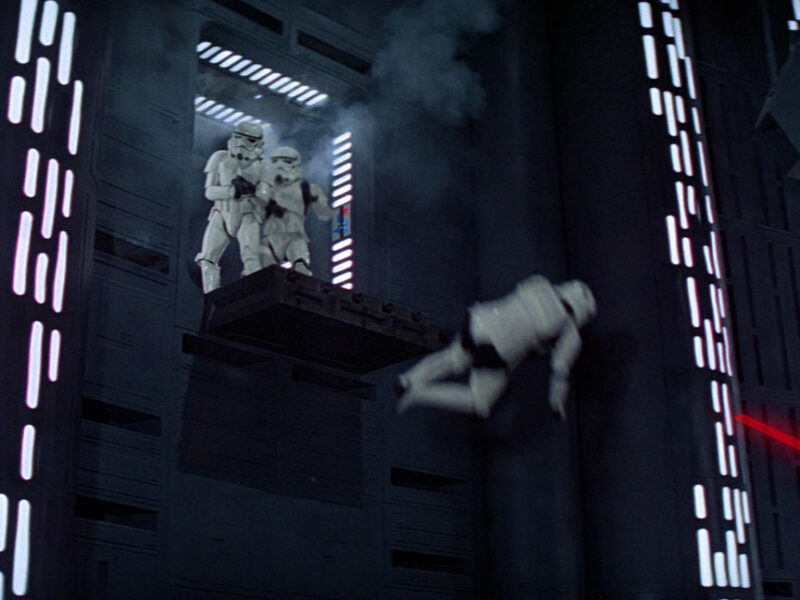 In a race against time, the Rebels blast off from their secret base on Arbra to destroy it before the Imperials realize and use it against them. Wrapped in a striking Jolly John Higgins cover painting of Artoo and Threepio, we were also treated to the regular letters page Cosmic Correspondence with our friendly editor droid C.Y.R.I.L and a further blast of ROM. 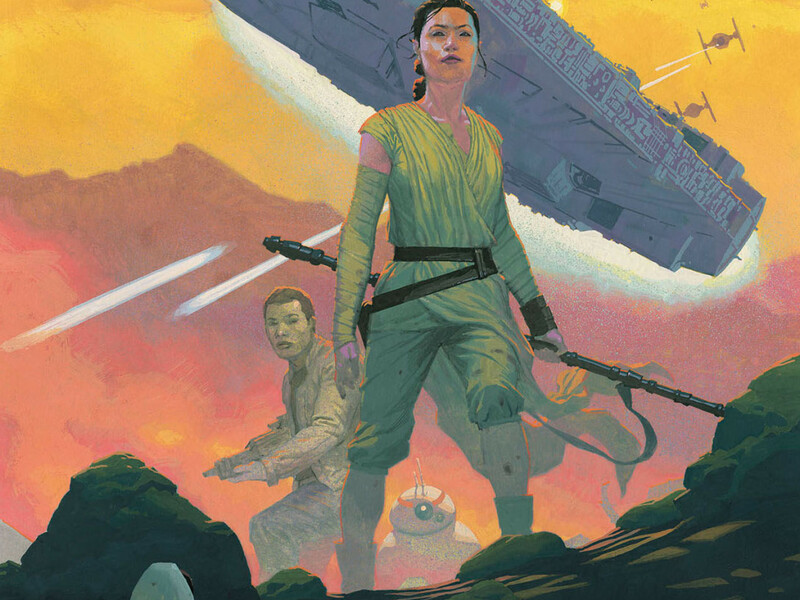 So there you have it — a dip into the unfamiliar waters of the UK Star Wars Monthly. 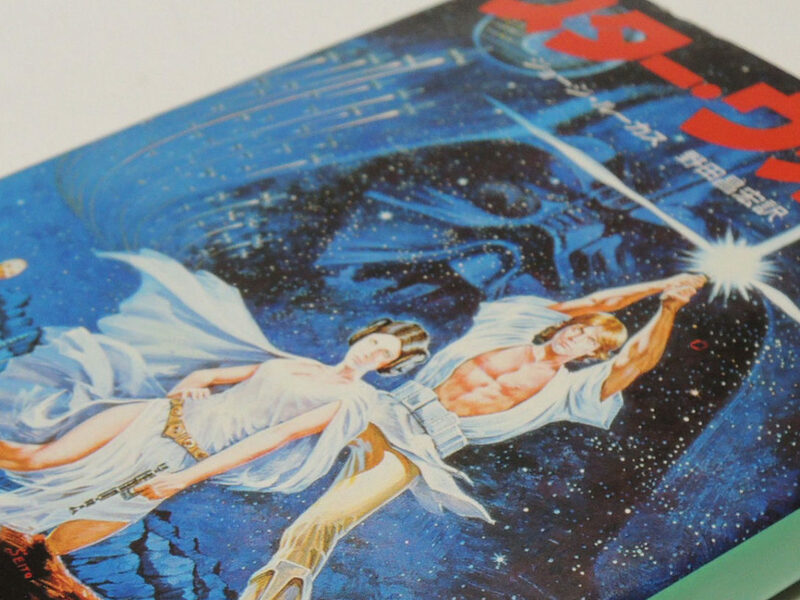 While it reprinted what had already gone before in the US title, it had an identity all of its own and played a huge role in keeping the spirit of Star Wars alive and well between films. 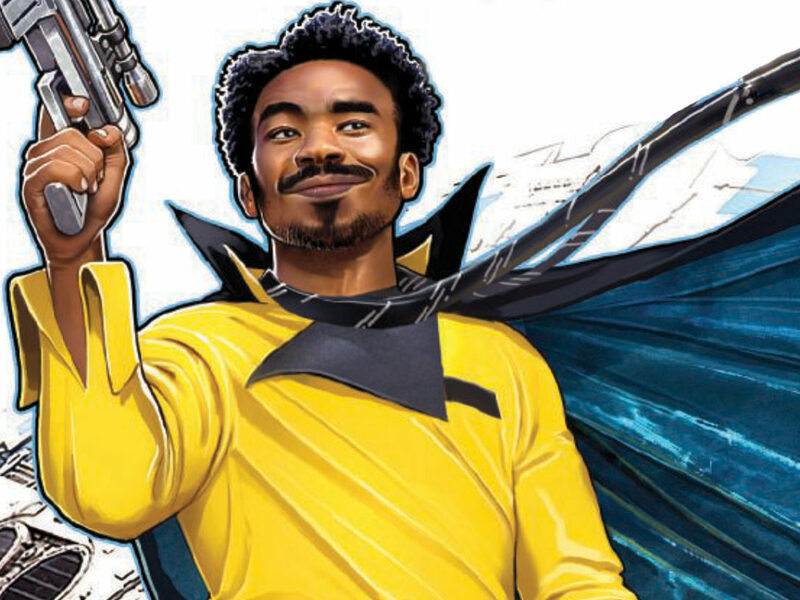 From where we sit right now, where a film a year is fast approaching with TV shows on the air and fresh content hitting StarWars.com, the role of comics these days is very different. But the part these titles played in the Star Wars story should never be underestimated or forgotten. 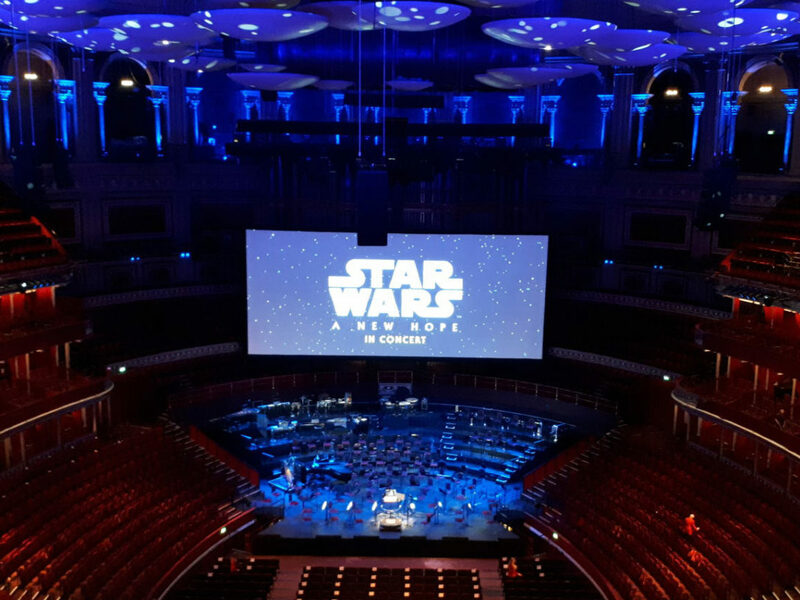 Mark Newbold is the co-owner of jedinews.co.uk and has been a contributor to Star Wars Insider since 2006. 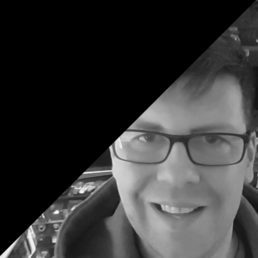 He also is the co-host alongside James Burns of the Radio 1138 podcast.